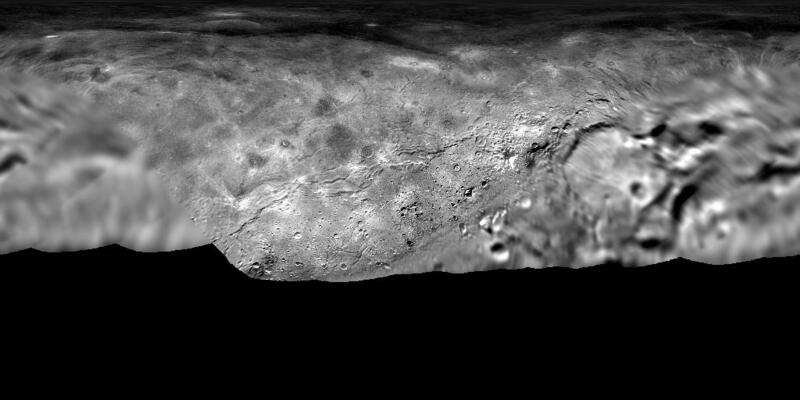 The mosaic is the most detailed and comprehensive global view yet of Charon’s surface using New Horizons data. Standing out on Charon is an enormous trough at least 350 kilometers long, and reaching 14 kilometers deep –more than seven times as deep as the Grand Canyon. Mosaic is available in Equirectangular projection at an equatorial pixel scale of 300 meters per pixel. ISIS3 cube 32bit formatted file is available from the ancillary section. This map was produced using radii of 1188.3 kilometers 606 kilometers for Charon. The original 32bit pixel values were stretch to 8bit (1-255) using a 0.5% to 99.5% range which resulted in in using the pixel value range from 0.10892 to 1.3745.